As you know, I've been on a weight loss journey for about a year by now. Some friends know me only big and fat, some - only skinny, and some know me skinny, big, and now. And you know what? Food is to blame for it all. I was always skinny, my metabolism was good, I was always active. And then Bum! about five years ago I started to gain weight: pound here, pound there, and at some point I was 190lb. It was hard for me to tie my shoes. Walking up a few stairs was a challenge to the point that I had to sleep in the leaving room to avoid shortness of breath and fatigue after climbing those stairs. My husband was heavy too, but he did impossible: he lost 40lb in a tree months period only by controlling what and how much he eats. I am not that strong, I needed food more than him, so he was more successful than me. I managed to loose 3lb! Yes, three, that's right! I knew I had to change something but didn't know what (food was out of the questions, I can't go hungry for a long time). So, I joined the gym, and forced myself to do exercise every day for at least 30 minutes. I tried different activities and found what I like and stick to it. First changes were not noticeable but I could feel it: I had more energy, I could go upstairs without gasping for the air on each step. But wait wasn't going down. I was turned on to a healthier lifestyle where "diet" wasn't on the agenda. We always ate healthy, but lately mainly processed food was occupying our refrigerator. That needed to change. I turned into a whole ingredients cook, driving nuts (not intentionally!) each sales person with a questions about the ingredients, additives, GMOs, etc. I was determined to eat chemical free food. The hardest part was to find a good meat, grass fed, grass finished, no antibiotics or hormones used. So we decided just not to eat meat. I am not a vegetarian Nazi, everyone should be a free to choose what and how to eat. No judgment here, dear friends! But what I can tell you from my experience that food, vegetarian or not, matters: the numbers on the stubborn scale started to go down when I began to watch what and how much I eat, and I still ate meat at that time. I am what I eat, or let the pictures speak for themselves. 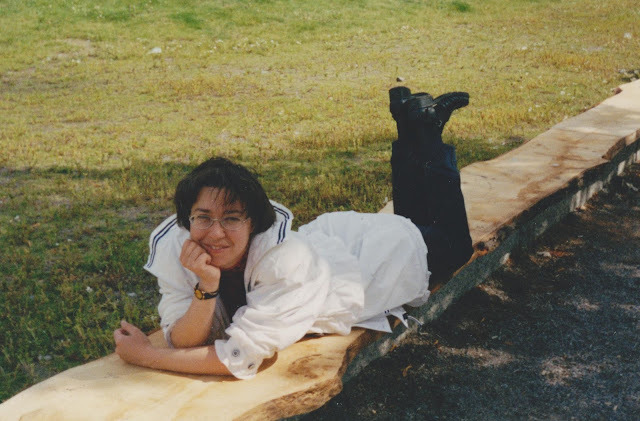 Skinny Me (around 125lb) circa 2000. Stockholm, Sweden. Do you think food matters? Oh my god!! seriously..this is fantastic :)..u look gorgeous & this is quite inspiring.. i have this ongoing battle with weight & pls go ahead & share some pointers.. i would love to some day do such a post..Great job & shout out to good & great life style and a healthier u ! Thank you Rasi. I sure will be sharing more on the subject. Food definitely matters. I think you look great! I know managing my weight will always be a part of my life - and that is ok, because I love cooking, and food in general! I try to eat meat free a majority of the time, but hubby is a huge meat lover! But he complemented me the other day - he ate some pizza at work and felt really bad afterwards and told me he needs to eat more "The Healthy Beehive way"! Keep at it, you are doing awesome! Thank you Jane. Same here, I love to cook, and my men in the house do love to eat meat from time to time. My job is to balance as much vegetables and grains into their diet as well as keeping myself on the track. Great post, I am right there with you. So hard to loose weight and I am not a big eater. I guess more exercise is important too. 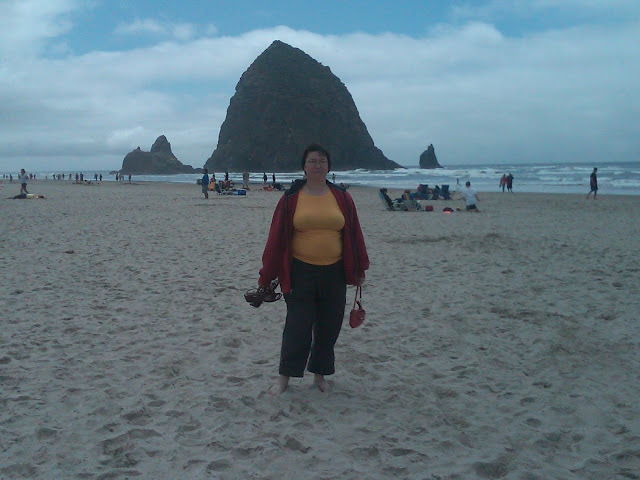 I love the shot at Canon Beach, I will be visiting there in July. Canon Beach is beautiful. I can never have enough of it, or any place on the Pacific coast! Congratulations on your weight loss! I cook all my own food so I don't fall into the "junk" trap but my weakness is bakes goods. I make a batch of cookies and then eat half a dozen for breakfast and another few before lunch... it's a problem :) Food really is so important- thank you for sharing. Yes, I know how it goes. That's why I decided not to bake, only from time to time. Thanks! Congrats on the success! 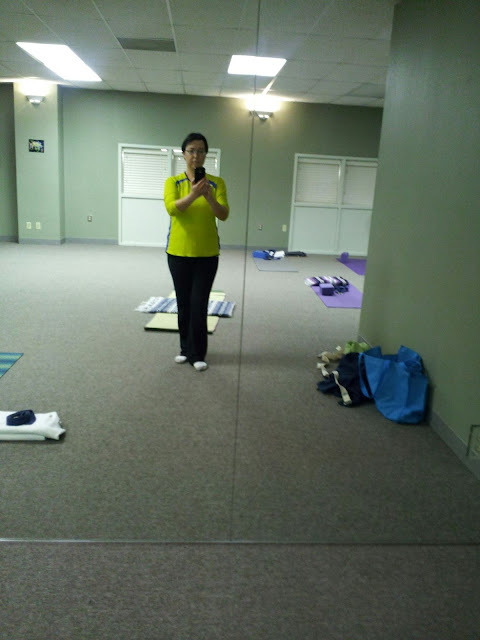 You look wonderful in the yoga class picture :-), healthy eating and exercise are really the key! Well done dear Marina! Keep it up! I am not a vegetarian nazi either, I don't eat meat and fish myself (it has been for well over two decades now) and I don't cook it at home so my kids have also been raised vegetarian (the living example that is it possible as they are super healthy and bright), but when they grow up they will decide themselves what to eat. Most of my friends are not vegetarians, yet they love my food, and they always cater for me when I go to their places, and if we go out they always look for a place where I can also eat something. Sometimes we joke, they call me rabbit, or I pretend to faint when I see a piece of meat, we are all good friends and never need to be 'politically correct', we just joke and have fun. During my life as a veggie lots of my friends followed suit in the end, I never told them too, I think that they just thought about it, and many liked my recipes, they said that they didn't feel like they needed to eat meat if their diet was similar to mine. And some of them lost weight! I learned one interesting fact: for many women the major problem was chicken. Now i don't know how are things over there, but I guess pretty similar for those who eat process food. Women tend to retain more water and fat, apparently, I used to go to the gym after I had my kids because I had put on a lot of weight, but there were some women that were three time my size. They didn't want to become vegetarian, but I told them to try to give up just chicken, and this includes everything flavoured with chicken: stock, chips, noodles, chicken flavoured snacks... the lot! Most of the chicken seem to be fat too processed, then they add lots of sodium and other stuff... very few people buy and clean a whole chicken, mostly they get he frozen ones, or pieces, or pre-cooked ones... very fatty food like chicken nuggets! For the men here the main problem seem to be sausages, and the fact that they don't eat enough greens to compensate for all the fat meat they eat. Well, enough writing, this has become a very long reply!! Sorry!!! Congratulations, you look great in the yoga photo. Yes, what we eat matters a great deal. I am not a vegetarian but my diet is heavily based on whole grains, nuts, veggies and frsh fruits. You must be thrilled...you look wonderful!!! I know you must feel better with better food to nourish you. Congratulations...and, yes, food matters. Lizzy, thank you. Am I thrilled? Yes and no. No is because I let myself to get to that stage of big me, for that I am angry with myself. You look wonderful!!!! Good luck to you ! You look fabulous. I agree that we definitely are what we eat. 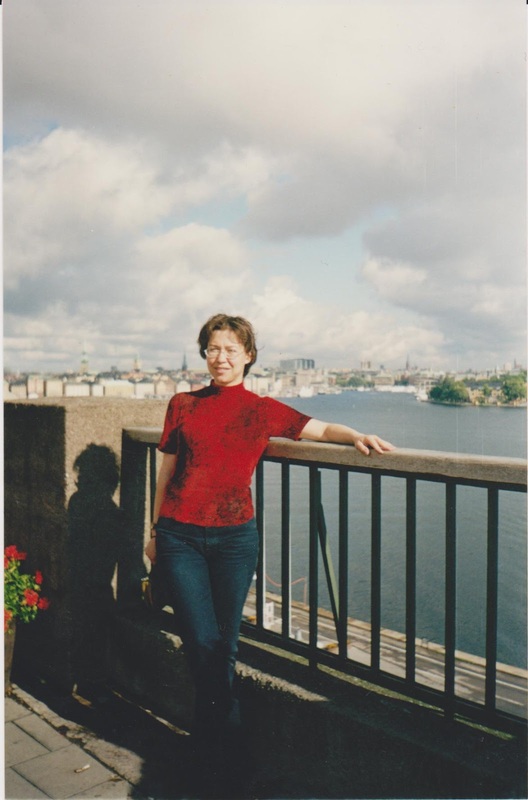 I have had to alter my diet significantly over the last decade to stave off major health problems. I feel so much better having cut out things my body couldn't handle. Kristen, thanks. You are the model of what and how food affect us. I am constantly amazed by your determination to control health problems with the food. Well done! First off - congratulations! You look amazing and you have really given your lifestyle and diet a great deal of thought! I completely agree that food matters - and you are what you eat. I try to give myself the opportunity to have everything within reason, but I realize that some things MUST be less or eliminated. You look marvelous and thank you for opening up and sharing your struggles. Thank you Ann. I am with you: moderation is a way to go. Although with baked goods I have to use word "limitation". Food indeed matters a lot. I and my husband are in the process of controlling our weight too! We thought we were on a diet and we gained weight and then we asked a dietitian and she proved to us that you don't have to starve to be thin! Congratulations on the effort you are doing and keep up the good work! Remember, you are doing this for a better life, better health, better you! Thank you Katerina. Your dietitian is correct: one does not need to starve to be thin. It's all about how much and what we eat. Some food doesn't live in our house: cookies, sweets, cakes, all artificial products, processed food is off the limits. When kids want sweets, there are always apples, nuts, dried fruits in the house. In the evening I put some baby carrots in a candy bawl and leave it on the table for them to nibble. I know they have junk sometimes, but we don't encourage it at home, so they don't crave for it. My son another day said that he realized he didn't have a McDonalds in a year. I asked him if he wants it, and he said he prefers a Subway. Apparently, we teach them by example too. Thank you Lorraine. I absolutely agree with you on that. Another benefit of the awareness what's in your food is a significant savings in the wallet. Surprising realization from my personal experience. Who would argue that! Thank you Liza! Impressive how a simple lunch in Green Papaya can change the life from unhealthy, boring, and to some point unhappy to a blooming and exciting journey! Thank you Eftychia, Creek cookbook is an amazing gift! What a great post! Congratulations on your journey. you know it is easier for men to lose weight than females; not fair but it is a fact. I think our choice in food does make a difference. Thank you Rita. Yes, I know, and how not fair it is! Good for you! I had a period in my life when I was a lot heavier than I am now and if I think back to that time - I wasn't exercising and I was eating processed junk most of the time. I'm still not super slim, but I'm not overweight either and I'm pretty comfortable with that. For me exercise makes a huge difference, for me anytime I start gaining weight always co-incides with a period when I'm not exercising. As you say cooking everything from scratch helps as well. Thank you Liz. I find cooking from scratch quite interesting: I learn new techniques, ingredients, ratio. It's fun, or that's how Ilook at it! what a wonderful heart felt post. Congratulations on your healthy journey. I too struggle with the ever ending weight gain weight loss. I eat healthy but sometimes I like to overeat those carbs. Good luck to you and all of us on this journey of healthy eating and moderation. Your post is inspirational. One has to be willing and stick to a healthy eating habit no matter what their health goal in life is. I too struggle with my fluctuating weight due to my medications but I think that if chose healthy food over some of the food I eat it will make a massive difference. Thank you for sharing your story Marina. I am glad you are inspired by this post. Not eating junk makes such a big difference: I did calculation for aweek of every single meal and snack I had. Let me tell you, I was shoked by the results!